This chapter describes the Open Shortest Path First (OSPF) routing protocol support in RouterOS. OSPF is Interior Gateway Protocol (IGP) and distributes routing information only between routers belonging to the same Autonomous System (AS). transfers and tags external routes injected into AS. MikroTik RouterOS implements OSPF version 2 (RFC 2328) and version 3 (RFC 5340, OSPF for IPv6). Term definitions related to OSPF operations. Neighbor - connected (adjacent) router that is running OSPF with the adjacent interface assigned to the same area. Neighbors are found by Hello packets. Adjacency - logical connection between router and its corresponding DR and BDR. No routing information is exchanged unless adjacencies are formed. Link - link refers to a network or router interface assigned to any given network. Interface - physical interface on the router. Interface is considered as link, when it is added to OSPF. Used to build link database. LSA - Link State Advertisement, data packet contains link-state and routing information, that is shared among OSPF neighbors. DR - Designated Router, chosen router to minimize the number of adjacencies formed. Option is used in broadcast networks. BDR -Backup Designated Router, hot standby for the DR. BDR receives all routing updates from adjacent routers, but it does not flood LSA updates. Area - areas are used to establish a hierarchical network. ABR - Area Border Router, router connected to multiple areas. ASBR - Autonomous System Boundary Router, router connected to an external network (in a different AS). NBMA - Non-broadcast multi-access, networks allow multi-access but have no broadcast capability (for example X.25, Frame Relay). Additional OSPF neighbor configuration is required for those networks. Broadcast - Network that allows broadcasting, for example Ethernet. Router-ID - IP address used to identify OSPF router. If the OSPF Router-ID is not configured manually, router uses one of the IP addresses assigned to the router as its Router-ID. Link State - The term link state refers to the status of a link between two routers. It defines the relationship between a router's interface and its neighboring routers. Cost - Link-state protocols assign a value to each link called cost. the cost value is depend to speed of media. A cost is associated with the outside of each router interface. This is referred to as interface output cost. Autonomous System - An autonomous system is a group of routers that use a common routing protocol to exchange routing information. All of these terms are important for understanding the operation of the OSPF and they are used throughout the article. OSPF is a link-state protocol. Interface of the router is considered an OSPF link and state of all the links are stored in link-state database. Link-state routing protocols are distributing, replicating database that describes the routing topology. Each router in routing domain collects local routing topology and sends this information via link-state advertisements (LSAs). LSAs are flooded to all other routers in routing domain and each router generates link-state database from received LSAs. The link-state protocol's flooding algorithm ensures that each router has identical link-state database. Each router is calculating routing table based on this link-state database. type 1 - (Router LSA) Sent by routers within the Area, including the list of directly attached links. Does not cross the ABR or ASBR. type 2 - (Network LSA) Generated for every "transit network" within an area. A transit network has at least two directly attached OSPF routers. Ethernet is an example of a Transit Network. A Type 2 LSA lists each of the attached routers that make up the transit network and is generated by the DR.
type 3 - (Summary LSA) The ABR sends Type 3 Summary LSAs. A Type 3 LSA advertises any networks owned by an area to the rest of the areas in the OSPF AS. By default, OSPF advertises Type 3 LSAs for every subnet defined in the originating area, which can cause flooding problems, so it´s a good idea to use a manual summarization at the ABR. type 4 - (ASBR-Summary LSA) It announces the ASBR address, it shows “where” the ASBR is located, announcing it´s address instead of it´s routing table. type 5 - (External LSA) Announces the Routes learned through the ASBR. External LSAs are flooded to all areas except Stub areas. These LSAs divides in two types: external type 1 and external type2. type 6 - (Group Membership LSA) This was defined for Multicast extensions to OSPF and is not used by ROuterOS. Note: If we do not have any ASBR, there´s no LSA Types 4 and 5 in the network. Looking at the link-state database each routing domain router knows how many other routers are in the network, how many interfaces routers have, what networks link between router connects, cost of each link and so on. OSPF runs directly over the IP network layer using protocol number 89. Destination IP address is set to neighbor's IP address or to one of the OSPF multicast addresses AllSPFRouters (224.0.0.5) or AllDRRouters (224.0.0.6). Use of these addresses are described later in this article. Every OSPF packet begins with standard 24-byte header. Area ID Allows OSPF router to associate the packet to the proper OSPF area. Checksum Allows receiving router to determine if packet was damaged in transit. Authentication fields These fields allow the receiving router to verify that the packet's contents was not modified and that packet really came from OSPF router which Router ID appears in the packet. There are five different OSPF packet types used to ensure proper LSA flooding over the OSPF network. Hello packet - used to discover OSPF neighbors and build adjacencies. Database Description (DD) - check for Database synchronization between routers. Exchanged after adjacencies are built. Link-State Request (LSR) - used to request up to date pieces of the neighbor’s database. Out of date parts of routes database are determined after DD exchange. Link-State Update (LSU) - carries a collection of specifically requested link-state records. Link-State Acknowledgment (LSack) - is used to acknowledge other packet types that way introducing reliable communication. Neighbors are discovered by periodically sending OSPF Hello packets out of configured interfaces. By default Hello packets are sent out with 10 second interval. This interval can be changed by setting hello interval. Router learns the existence of a neighboring router when it receives the neighbor's Hello in return. The transmission and reception of Hello packets also allows router to detect failure of the neighbor. If Hello packets are not received within Dead interval (which by default is 40s) router starts to route packets around the failure. Hello protocol ensures that the neighboring routers agree on the Hello interval and Dead interval parameters, preventing situations when not in time received Hello packets mistakenly bring the link down. network mask The IP mask of the originating router's interface IP address. On each type of network segment Hello protocol works a little different. It is clear that on point-to-point segments only one neighbor is possible and no additional actions are required. However if more than one neighbor can be on the segment additional actions are taken to make OSPF functionality even more efficient. Note: Network mask, Priority, DR and BDR fields are used only when the neighbors are connected by a broadcast or NBMA network segment. Two routers do not become neighbors unless the following conditions are met. Two way communication between routers is possible. Determined by flooding Hello packets. External routing and NSSA flags should be the same in Hello packets. Attached node to the broadcast subnet can send single packet and that packet is received by all other attached nodes. This is very useful for auto-configuration and information replication. 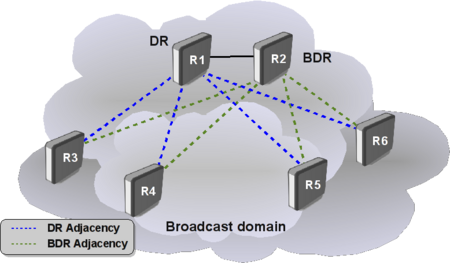 Another useful capability in broadcast subnets is multicast. This capability allows to send single packet which will be received by nodes configured to receive multicast packet. OSPF is using this capability to find OSPF neighbors and detect bidirectional connectivity. Consider Ethernet network illustrated in image below. OSPF Broadcast network Each OSPF router joins the IP multicast group AllSPFRouters (224.0.0.5), then router periodically multicasts its Hello packets to the IP address 224.0.0.5. All other routers that joined the same group will receive multicasted Hello packet. In that way OSPF routers maintain relationships with all other OSPF routers by sending single packet instead of sending separate packet to each neighbor on the segment. Automatic neighbor discovery by multicasting or broadcasting Hello packets. Less bandwidth usage compared to other subnet types. On broadcast segment there are n*(n-1)/2 neighbor relations, but those relations are maintained by sending only n Hellos. If broadcast has multicast capability, then OSPF operates without disturbing non-OSPF nodes on the broadcast segment. If multicast capability is not supported all routers will receive broadcasted Hello packet even if node is not OSPF router. Nonbroadcast multiaccess (NBMA) segments similar to broadcast supports more than two routers, only difference is that NBMA do not support data-link broadcast capability. Due to this limitation OSPF neighbors must be discovered initially through configuration. On RouterOS NBMA configuration is possible in/routing ospf nbma-neighbor menu. To reduce the amount of Hello traffic, most routers attached to NBMA subnet should be assigned Router Priority of 0 (set by default in RouterOS). Routers that are eligible to become Designated Routers should have priority values other than 0. It ensures that during election of DR and BDR Hellos are sent only to eligible routers. Point-to-MultiPoint treats the network as a collection of point-to-point links. On PTMP subnets Hello protocol is used only to detect active OSPF neighbors and to detect bidirectional communication between neighbors. Routers on PTMP subnets send Hello packets to all other routers that are directly connected to them. Designated Routers and Backup Designated routers are not elected on Point-to-multipoint subnets. Link-state Database synchronization between OSPF routers are very important. When the connection between two neighbors first come up, initial database synchronization will happen. Unsynchronized databases may lead to calculation of incorrect routing table, resulting in routing loops or black holes. OSPF is using explicit database download when neighbor connections first come up. This procedure is called Database exchange. Instead of sending the entire database, OSPF router sends only its LSA headers in a sequence of OSPF Database Description (DD) packets. Router will send next DD packet only when previous packet is acknowledged. When entire sequence of DD packets has been received, router knows which LSAs it does not have and which LSAs are more recent. The router then sends Link-State Request (LSR) packets requesting desired LSAs, and the neighbor responds by flooding LSAs in Link-State Update (LSU) packets. After all updates are received neighbors are said to be fully adjacent. Reliable flooding is another database synchronization method. It is used when adjacencies are already established and OSPF router wants to inform other routers about LSA changes. When OSPF router receives such Link State Update, it installs new LSA in link-state database, sends an acknowledgement packet back to sender, repackages LSA in new LSU and sends it out all interfaces except the one that received the LSA in the first place. OSPF determines if LSAs are up to date by comparing sequence numbers. Sequence numbers start with 0×80000001, the larger the number, the more recent the LSA is. Sequence number is incremented each time the record is flooded and neighbor receiving update resets Maximum age timer. LSAs are refreshed every 30 minutes, but without a refresh LSA remains in the database for maximum age of 60 minutes. 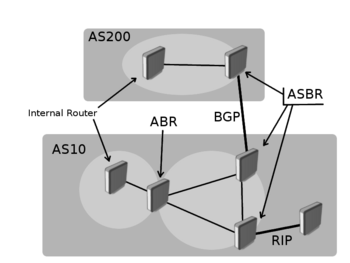 Databases are not always synchronized between all OSPF neighbors, OSPF decides whether databases needs to be synchronized depending on network segment, for example, on point-to-point links databases are always synchronized between routers, but on ethernet networks databases are synchronized between certain neighbor pairs. On broadcast segment there are n*(n-1)/2 neighbor relations, it will be huge amount of Link State Updates and Acknowledgements sent over the subnet if OSPF router will try to synchronize with each OSPF router on the subnet. This problem is solved by electing one Designated Router and one Backup Designated Router for each broadcast subnet. All other routers are synchronizing and forming adjacencies only with those two elected routers. This approach reduces amount of adjacencies from n*(n-1)/2 to only 2n-3. Image on the right illustrates adjacency formations on broadcast subnets. Routers R1 and R2 are Designated Router and Backup Designated router respectively. For example, R3 wants to flood Link State Update (LSU) to both R1 and R2, router sends LSU to IP multicast address AllDRouters (224.0.0.6) and only DR and BDR listens to this multicast address. Then Designated Router sends LSU addressed to AllSPFRouters, updating the rest of the routers. DR and BDR routers are elected from data received in Hello packet. The first OSPF router on a subnet is always elected as Designated Router, when second router is added it becomes Backup Designated Router. When existing DR or BDR fails new DR or BDR is elected taking into account configured router priority. Router with the highest priority becomes the new DR or BDR. Being Designated Router or Backup Designated Router consumes additional resources. If Router Priority is set to 0, then router is not participating in the election process. This is very useful if certain slower routers are not capable of being DR or BDR. Database synchronization on NBMA networks are similar as on broadcast networks. DR and BDR are elected, databases initially are exchanged only with DR and BDR routers and flooding always goes through the DR. The only difference is that Link State Updates must be replicated and sent to each adjacent router separately. On PTMP subnets OSPF router becomes adjacent to all other routes with which it can communicate directly. When link-state databases are synchronized OSPF routers are able to calculate routing table. Link state database describes the routers and links that interconnect them and are appropriate for forwarding. It also contains the cost (metric) of each link. This metric is used to calculate shortest path to destination network. Each router can advertise a different cost for the router's own link direction, making it possible to have asymmetric links (packets to destination travels over one path, but response travels different path). Asymmetric paths are not very popular, because it makes harder to find routing problems. Cost = 100000000/bw in bps. OSPF router is using Dijkstra's Shortest Path First (SPF) algorithm to calculate shortest path. The algorithm places router at the root of a tree and calculates shortest path to each destination based on the cumulative cost required to reach the destination. 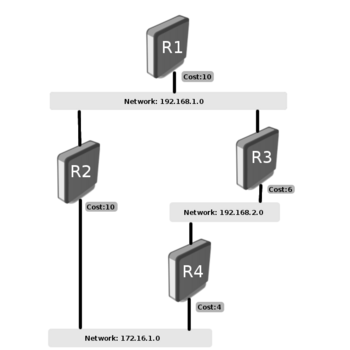 Each router calculates own tree even though all routers are using the same link-state database. Assume we have the following network. Network consists of 4(four) routers. OSPF costs for outgoing interfaces are shown near the line that represents the link. In order to build shortest path tree for router R1, we need to make R1 the root and calculate the smallest cost for each destination. As you can see from image above multiple shortest paths have been found to 172.16.1.0 network, allowing load balancing of the traffic to that destination called equal-cost multipath (ECMP). After the shortest path tree is built, router starts to build the routing table accordingly. Networks are reached consequently to the cost calculated in the tree. Routing table calculation looks quite simple, however when some of the OSPF extensions are used or OSPF areas are calculated, routing calculation gets more complicated. Let's look how to configure single-area OSPF network. One command is required to start OSPF on MikroTik RouterOS - add network in ospf network menu. Let's assume we have the following network. It has only one area with three routers connected to the same network 172.16.0.0/24. 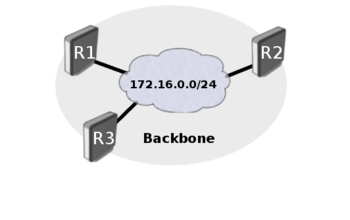 Backbone area is created during RouterOS installation and additional configuration is not required for area settings. As you can see OSPF is up and running, notice that router-id is set the same as IP address of the router. It was done automatically, because router-id was not specified during OSPF configuration. Add a network to assign interface to the certain area. Look at the OSPF interface menu to verify that dynamic entry was created and correct network type was detected. Last thing to check whether LSA table is generated properly. We have three router links and one network link. All properties are explained in LSA reference manual. Congratulations, we have fully working OSPF network at this point. It is possible to secure OSPF packets exchange, MikroTik RouterOS provides two authentication methods, simple and MD5. OSPF authentication is disabled by default. Simple authentication is plain text authentication method. Method is vulnerable to passive attacks, anybody with packet sniffer can easily get password. Method should be used only to protect OSPF from mis-configurations. MD5 is a cryptographic authentication and is more preferred. Authentication-key, key-id and OSPF packet content is used to generate message digest that is added to the packet. Unlike the simple authentication method, key is not exchanged over the network. Authentication-key-id value is 1, when authentication is not set (even for router that do not allow to set key id at all). Each router recalculates database every time whenever network topology change occurs, the process takes CPU resources. Each router holds entire link-state database, which shows the topology of the entire network, it takes memory resources. Complete copy of the routing table and number of routing table entries may be significantly greater than the number of networks, that can take even more memory resources. Updating large databases require more bandwidth. backbone (transit) area - Primary function of this area is the fast and efficient movement of IP packets. 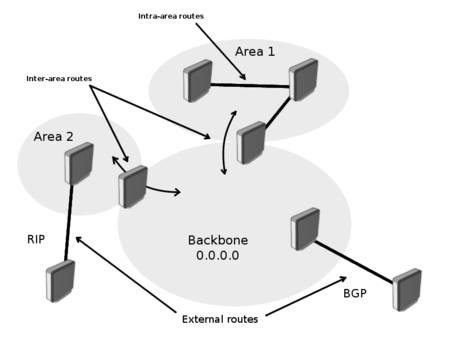 Backbone area interconnects other areas and generally, end users are not found within a backbone area. Each area is identified by 32-bit Area ID and has its own link-state database, consisting of router-LSAs and network-LSAs describing how all routers within that area are interconnected. Detailed knowledge of area's topology is hidden from all other areas; router-LSAs and network-LSAs are not flooded beyond the area's borders. Area Border Routers (ABRs) leak addressing information from one area into another in OSPF summary-LSAs. This allows to pick the best area border router when forwarding data to destinations from another area and is called intra-area routing. Routing information exchange between areas is essentially Distance Vector algorithm and to prevent algorithm's convergence problems, such as counting to infinity, all areas are required to attach directly to backbone area making simple hub-and-spoke topology. Area-ID of backbone area is always 0.0.0.0 and can not be changed. intra-area routes - routes generated from within an area (destination belongs to the area). inter-area routes - routes originated from other areas, also called Summary Routes. 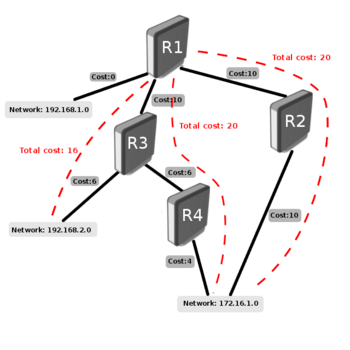 external routes - routes originated from other routing protocols and that are injected into OSPF by redistribution. On the edge of an OSPF routing domain, you can find routers called AS boundary routers (ASBRs) that run one of other routing protocols. The job of those routers are to import routing information learned from other routing protocols into the OSPF routing domain. External routes can be imported at two separate levels depending on metric type. OSPF provides several area types: backbone area, standard area, stub area and not-so-stubby area. All areas are covered later in the article. Backbone area is the core of all OSPF network, all areas have to be connected to backbone area. Start configuring OSPF from backbone and then expand network configuration to other areas. Consider the multi-area network shown below. OSPF external routes are routes that are being redistributed from other routing protocols or from static routes. 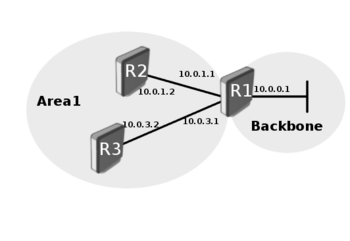 10.0.5.0/24 and 10.0.4.0/24 networks are redistributed from R3 over OSPF now. But we do not want other routers to know that 10.0.5.0/24 is reachable over router R3. To achieve it we can add rules in routing filters inside "ospf-out" chain. Routing filters provide two chains to operate with OSPF routes: ospf-in and ospf-out. Ospf-in chain is used to filter incoming routes and ospf-out is used to filter outgoing routes. More about routing filters can be found in routing filters reference manual. All OSPF areas have to be attached to the backbone area, but sometimes physical connection is not possible. In this case areas can be attached logically by using virtual links. Also virtual links can be used to glue together fragmented backbone area. 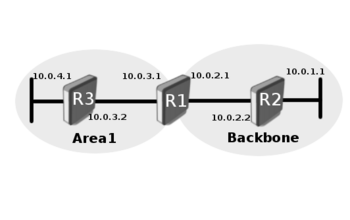 Area may not have physical connection to backbone, virtual link is used to provide logical path to the backbone of the disconnected area. Link has to be established between two ABRs that have common area with one ABR connected to the backbone. We can see that both R1 and R2 routers are ABRs and R1 is connected to backbone area. Area2 will be used as transit area and R1 is the entry point into backbone area. Virtual link has to be configured on both routers. OSPF allows to link discontinuous parts of the backbone area using virtual links. This might be required when two separate OSPF networks are merged into one large network. Virtual link can be configured between separate ABRs that touch backbone area from each side and have a common area. Additional area could be created to become transit area, when common area does not exist, it is illustrated in the image above. Virtual Links are not required for non-backbone areas, when they get partitioned. OSPF does not actively attempt to repair area partitions, each component simply becomes a separate area, when an area becomes partitioned. The backbone performs routing between the new areas. Some destinations are reachable via intra-area routing, the area partition requires inter-area routing. However, to maintain full routing after the partition, an address range has not to be split across multiple components of the area partition. Route summarization is consolidation of multiple routes into one single advertisement. It is normally done at the area boundaries (Area Border Routers), but summarization can be configured between any two areas. It is better to summarize in the direction to the backbone. Then way the backbone receives all the aggregate addresses and injects them into other areas already summarized. There are two types of summarization: inter-area and external route summarization. Inter-area route summarization is done on ABRs, it does not apply to external routes injected into OSPF via redistribution. Summarization configuration is done in OSPF area range menu. Main purpose of stub areas is to keep such areas from carrying external routes. Routing from these areas to the outside world is based on a default route. Stub area reduces the database size inside an area and reduces memory requirements of routers in the area. Stub area has few restrictions, ASBR routers cannot be internal to the area, stub area cannot be used as transit area for virtual links. The restrictions are made because stub area is mainly configured not to carry external routes. Totally stubby area is an extension for stub area. A totally stubby area blocks external routes and summarized (inter-area) routes from going into the area. Only intra-area routes are injected into the area. inject-summary-lsa=no is used to configure totally stubby area in the RouterOS. Let's consider the example above. 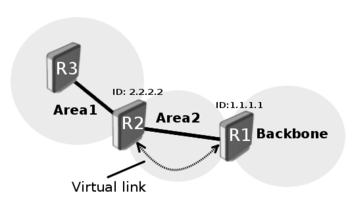 Area1 is configured as stub area meaning that routers R2 and R3 will not receive any routing information from backbone area except default route. Not-so-stubby area (NSSA) is useful when it is required to inject external routes, but injection of type 5 LSA routes is not required. Look at the image above. There are two areas (backbone and area1) and RIP connection to area1. We need Area1 to be configured as stub area, but it is also required to inject external routes from RIP protocol. Area1 should be configured as NSSA in this case. Configuration example does not cover RIP configuration. NSSA areas have one another limitation: virtual links cannot be used over such area type. This page was last edited on 1 February 2018, at 16:08.